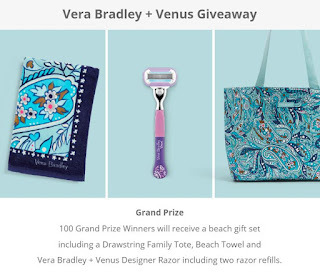 Vera Bradley Venus Prize Pack Giveaway - 100 Winners Win a Vera Bradley Tote, Vera Bradley Beach Towel and Venus Razor. Limit One Entry, Ends 4/5/19. Nice prizes, short giveaway, one entry. GOOD LUCK!! PRIZES: Grand Prizes: Grand Prize Winner will be awarded i) a Vera Bradley Lighten Up Drawstring Family Tote ($60), ii) a Vera Bradley Beach Towel ($40), and iii) Venus + Vera Bradley modular razor with two refill razors ($12.99). Grand Prize has an approximate retail value (“ARV”) of $112.99. Total ARV of all Grand Prizes is $11,299.